Class Description: The spring breeze in the mountains stirs the flowers of Mountain Laurel and Dogwood. This piece celebrates the layers of blossoms, which are interpreted with multiple tiers of silks and metal as we create an exquisite floral on fabric with cantilevered, detached elements. Working over a laid silk foundation the superimposed flowers of Mountain Laure are worked in silks with both padded satin and long and short stitches. Flower markings are red silk and beads. Stamens with anthers are raised above with Gilt Sylke Twist combined with beads. Buds are worked in raised spider using twisted silk. The detached leaves are worked in close couched wired organza. Dogwood flowers are stitched on silk organza in several techniques within wired long and short blanket stitch: long and short and sequins. Centers are raised twists of Gilt Sylke Twist and beads. Branches are assembled with dark wire and flowers to cantilever over the Mountain Laurel. The class will work on 3 separate frames: one silk over linen, 2 organza. Class Description: The sea is alive with the colors of summer. Butterflies in the water dancing along the reefs. The warmth of the sun shines in the gold metallics as you shade your fish created in Japanese golds and soft twist silks over padding. Heat distressed cellophane and beads form the bubbles. You will learn to couch in pairs, to and fro, round and round to fill a shape. Making sharp turns with the gold threads will be stressed and you will learn to pad a shape with felt and string. Working with an iron we will distress the cellophane to create bubbles to be appliquéd with beads to our special fabric. Options in design: Placement and number of fish and bubbles are at the discretion of the student. Accents of beads and goldwork add a feeling of opulence to the summer sunshine. The foreground supporting the couched butterflies is silk interlock canvas, which allows the sparkling butterflies to drift over the flowers. Threads used include many sizes of braid, check purl and several hues of Soie Mori. Special Loch Rosen crystals add to an assortment of bugle and seed bead embellishments. Size: 8” X 10” design on 13” X 18” Congress Cloth and interlock silk canvas. Depth is at the discretion of the student. Class Description: An exotic melody, a flight, a voyage of exploration—using research into stitch and motif that was done at the Kent State University Museum, we will explore the world of Chinese embroidery while stitching butterflies and insects amid a bower of cherry blossoms. We will also travel to the Suzhou Embroidery Research Institute through slides taken while I was on tour there of the secluded gardens and workshop rooms. In edition we will learn from actual samples of fabrics, threads, and embroideries produced there. Samples of other Chinese embroideries will be available for discussion and students are encouraged to bring their own Chinese embroidery treasures to share with the class. We will also explore the world of Chinese symbolism and stitch with stranded silk and Japanese gold. Size: 6.5" x 9" design on 7.5"x 10"
Class Description: The forgotten pleasures of the court of the Egyptian queen emerges as thoughts drift in the gentle breeze of a jewel colored fan on golden papyrus. Working with silk, metal, and beads on gold bounce painted # 24 congress cloth, the class will learn a method of coloring the canvas. This will be demonstrated and students will get a chance to do a small sample that can be used for another project. The painted canvas for the class will be provided. The students will learn silk satin stitching over padding and superimposed couching, pattern couching, and beading in addition to working with the silk and metal threads. The silk fibers used are flat silk, Soie Crystale, Zwicky, and silk sewing thread. These are combined with # 1 gold, braids, and bugle beads. Class Description: Using the lotus petaled ore of an Egyptian queen, the journey begins on golden canvas and jewel colored silks as ancient times linger. This class is chance to learn a number of ways of working with silk, metal, and beads on gold bounce painted # 24 congress cloth. The method of coloring the canvas will be demonstrated and students will get a chance to do a small sample that can be used for another project. The painted canvas for the class will be provided. The students will learn diagonal and vertical satin stitching over padding and superimposed couching, pattern couching, composite stitches and beading in addition to working with the silk and metal threads. The silk fibers used are flat silk, Soie Crystale, Zwicky, and silk sewing thread. These are combined with # 1 gold, braids, and bugle beads. Class Description: The bright copper draws the eye in as we contemplate images of the past seasons in stylized forms and patterns. The students will explore new and traditions techniques in silk and metal. Working with canvas filling stitches we will bring the work of traditional canvas work into the 21st century. Copper sheeting with embellishment is used to create the focal point of the design. Goldwork applications and beadwork add to the beauty of the needlework. Class Description: Using a simple design technique, the students will develop their own designs and stitch patterns to complete a stitch diagram so that they will have a working system to start their piece in class or at home. Texture and value and their relationship in metal thread work will be discussed to develop pattern couchings and fillings. There will be discussion of the types, design implications, and uses of the many metal threads provided. The student will develop a chart that will help in evaluating the threads as to shape, value, and texture, so that they can apply this knowledge to the design work. Because the emphasis will be on designing, the student should have had previous experience with silk and metal threads. Numerous stitch patterns will be provided but the students will be encouraged to investigate their own ideas to be worked in sampler form on the 28 count linen. The samples worked in class can be inserted into a notebook for future reference if so desired. There will be a brief discussion of using the computer to develop patterns. Silk and Metal thread techniques taught include: Framing up linen fabric; design transfer; couching Kid and Japanese paper; Kid applied over cord; Couching: Japanese Golds and twists, Torsade, Jaceron; Attaching: Jaceron, Smooth Purl, Plate, and beads. Design size at the discretion of the student but limited to 8"x 10." The sampler and design will be worked on one piece of linen approximately 18" x 12." After deciding on a design, the student will be able through a unique system to exchange credits for the metal threads they need for their work. SPECIAL CLASSROOM REQUIREMENTS: Flip Chart and Floor Ease. Slide Projector for 1 hour the first morning. Use of a copy machine would be extremely helpful but not essential. Class Description: Reaching into the materials from the distant past and into those on the cutting edge of the future we will explore many facets of metal thread embroidery in relationship to canvas work. Our focus will be on ways of celebrating and interpreting nature, specifically trees, in relation to three-dimensional metal embroidery. Each glittering leaf will be an exquisite jewel individually suspended from a gilded branch over a gilded trunk. We will develop the background through voided areas and contemporary combinations of composed of interpretative canvas stitches over acrylic painted Congress cloth. The students will develop their own designs from the research of trees, leaves, and bark patterns. There will be discussion of the types, design implications, and uses of the many metal threads, metals, and padding material provided. The students will be encouraged to experiment with new ideas in working. Students will have a chance to create metal fabrics using metallics, metals, and dissolvable sheeting. Stitch techniques include metal thread embroidery over padding, surface embroidery over canvas stitches, and needle lace. Some of the materials provided are metallic braid, purl purl, check purl, Torsade, wire in copper and gold color in several gauges, metal sculptural mesh, and copper and gold foils. Padding materials explored: cord, and paper roping. Using a few simple tools provided by the teacher, we will construct metal composite threads and make purls and new adaptations of purls. The student are encouraged to bring pertinent materials for home. They should also bring a sense of play and humor as we use some of the oldest and newest materials available today to create exciting new interpretations. Class Description: Combining geometric and organic serpentine shapes, we will explore the beauty of goldwork. To emphasis the dimensional effect of stitching direction available in Japanese gold, we will bring a rich and elegant design to life. Goldwork techniques of cutwork and many couching variations will be employed as we explore the ways to bring together East and West. Class Description: The trickle of a pool, the whisper of a breeze on our fan, the glow of late spring flowers invite the us to daydream of times past and follow the new growth into the future as we combine the elegance of traditional oriental design with Japanese and Western silk and metal techniques. For dimensional effects we will be using string, felt, and stitch padding techniques. Japanese embroidery techniques of tie dye and modified flax leaf effects are combines with lattice work, superimposed embroidery, and many couching variations. Size: 12" X 16" design on 14" X 20"
Classroom Equipment: Flip Chart and Floor Ease. their own ideas. There will be a brief discussion of using the computer to develop patterns. focusing on goldwork. For dimensional effects we will be using padding and raised metal techniques. Detached elements, goldwork, and surface embroidery stitches are also explored. All the principles of good design will be stressed. There will be discussion of the types, design implications, and uses of the many silk and metal threads provided. Because the emphasis will be on designing, the student should have had previous experience with silk and metal threads. Silk and Metal thread techniques taught include: design transfer; padding techniques, couching: braids, pearl purl, passing thread; attaching: pearl purl, paillettes, pearls. Surface embroidery stitches: plaited braid, open Ceylon stitch, detached buttonhole, and woven spider stitch. We will be using one of the newest composite threads on the market: Gilt Sylke Twist™. It is said that the individual wearing an emerald can feel a surge in creativity, artistic talents, and the skill to innovate and form ideas better. It is a stone of inspiration and infinite patience; and it embodies unity, compassion and unconditional love—fidelity. We will be surrounding this lovely jewel with the sparkle of crystal and amethyst to bring out its brilliance. The radiating, detached elements suggest the essence of the stone. Students will lay silk in diamond Waffle stitch and mount the center stone with shisha technique. Smaller imitation emeralds, montees, Loch Rosen crystals, braids, seed beads and sequins are stitched in various combinations along with detached wired elements. The foundations are Congress cloth and green sparkle organza. Class Description: Reaching into the materials from the distant past and into those on the cutting edge of the next millennium we will explore the many facets of metal thread embroidery. Our focus will be on ways of celebrating and interpreting nature, specifically trees, in relation to three dimensional metal embroidery. Each glittering leaf will be an exquisite jewel individually suspended from a gilded branch over a gilded trunk. A brief time will be spent developing the background and some padding materials with acrylic paint. The students will develop their own designs from the research of trees and bark patterns. There will be discussion of the types, design implications, and uses of the many metal threads, metals, and padding materials provided. The studentswill be encouraged to experiment with new ideas in working. Students will have a chance to create metal fabrics using metallics, metals, and dissolvable sheeting. Stitch techniques include metal thread embroidery over padding, surface embroidery, and needle lace. Some of the materials provided are metallic braid, purl purl, check purl, Japanese golds, Torsade, wire in copper and gold color in several gauges, metal sculptural mesh, and copper and gold foils and sheeting. Padding materials explored: industrial felt, cord, and paper roping. Cost: $112.00 includes the working frame. Size: At the discretion of the student but limited to 14" x 18"
Classroom Equipment: Flip chart, floor easel, draped area for painting canvas, water source. Class Description: Fiocco Fantastico Italian for Fantastic Tassel. Dream of elegant evenings in your fabulous villa as you are engaged in working this elegant interpretation embroidered on congress cloth.For dimensional effects we will be using padding in numerous ways: bead wire, cord, string, felt, and card. Flat and twisted silk are the foundations for superimposed satin over card, beads, and goldwork. The use of random Blackwork variations blend the background from foreground into the distance.Students will be encouraged to use their own ideas for some color and stitch interpretations. Size: 7.5"x 10" design on 14" X 15.75"
Class Description: Fiocco Favoloso is Italian for Fabulous Tassel Elegant evenings in a fantastic villa are yours for the dreaming as you are immersed in working this sumptuous interpretation embroidered on congress cloth.For dimensional effects we will be using padding in numerous ways: bead wire, cord, string, and felt Flat and twisted silk are the foundations for superimposed beads and wired check purl. Knotted lacework in silk and braid covers the upper skirt and padded goldwork is used to create frills on either side of crinkle edged silk herringbone.. The use of random Blackwork variations blend the background from foreground into the distance.Students will be encouraged to use their own ideas for some color and stitch interpretations. Class Description: We will begin by playing with a variety of contemporary materials and ways of using them to create new surfaces. Our focus will be on ways of celebrating and interpreting nature, specifically ice with crocus in silk and metal embroidery. We will develop the background through voided areas and contemporary combinations of composed of interpretative canvas stitches on Congress cloth with applique. The students will develop their own designs from the research of ice and crocus. There will be discussion of the types of design implications, and uses of the many materials provided. The students will be encouraged to experiment with new ideas in working and will have a chance to create dimensional foundations. Unusual materials and techniques will be explored: Tyveck®, Lutradur®, cellophane, Angelina®, bonding web, and making wired silk flowers. The students are encouraged to bring pertinent materials from home. They should also bring a sense of play and humor as we use some of the oldest and newest materials available today to create exciting new interpretations. Class Description: The candle’s light is reflected in the gold and sumptuous silks and the scent of roses drifts thru the air. The sounds of the guitar beckon you to listen and to join in the dance. 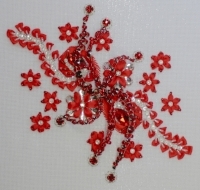 Our class will combine silk thread and metal thread embroidery techniques with ribbonwork and new and unusual needlework materials: Memory Thread and plastic screening. Techniques explored: couching a variety of materials some over padding, filling stitches, appliqué, and beadwork. Students will have some design options. Come dance to the rhythms of castanets, fans and needles with passion and joy! Class Description: With the lovely embroideries of China as our guide we will pursue the art of working gossamer flights of butterflies on silk organza. The class will travel with me to the Suzhou Embroidery Research Institute through slides I took during my tour of the secluded gardens and workshop rooms. In edition we will learn from actual samples of fabrics, threads, and embroideries produced and collected in Suzhou. Samples of other Chinese embroideries will be available for discussion and students are encouraged to bring their own Chinese embroidery treasures to share with the class. We will explore the world of Chinese symbolism and stitch a flight of butterflies in stranded silk. Shading will be the key to embroidering the butterflies and there will be an opportunity to study double sided work. Size: 5"x 7" design on 7.5"x 12"
Class Description: Combining the elegance of traditional design with the beauty and glitter of some of the oldest and newest techniques and materials we will encompass the depth and breath of silk and metal embroidery. For dimensional effects we will be using padding and raised metal techniques. Pattern couching, Goldwork, and canvas stitches are also explored. Flat and twisted silks will be used and we will create new threads by combining purls, wire, foils, and metallics. The use of vertical Blackwork bands defines the background. Size: 7.75" X 11.5" design on 11.5" X 15"
Class Description: A gilt apparition floats high above a rich field of burgundy and gold. This golden roundel is interpreted with multi-layered silks and metal as we create an exquisite floral on canvas with cantilevered, detached elements. Hand twisted braid combines with pearl purl to form the foundation on which, the detached elements work their magic. The detached elements are worked separately on sheer fabric in the creation of this exquisite embroidery. Milliary, check purl and pearl purl are used in various combinations throughout along with gold foil, beads and several gauges of wire. Celebrating the warmth, glitter and glow of a stylized golden tree we will interpreted it with beads, sequins and metal threads creating a contemporary design on canvas with detached elements. Students will work with Lutradur®, check purl, sequins, montees, braids and sequins in various combinations along beads and wire. Size: At the students’ discretion. Class Description: Holly glistens in a crystalline haze. You will learn to couch in pairs to fill a shape with Japanese silver. Making sharp turns with the silver threads will be stressed. We will use the ancient technique of Or Nué to shade the metal into the holly “floating” in the silver. Rousing with beads form the field of snow around the perimeter. Class Description: With elegant poetry and a glimmer from down glittering corridors of an age long past comes a glimpse of life we can but dream. Giving new interpretation to designs of the seventeenth century and blending them with the silk and metal of the twenty first, we will create an exquisite floral on silk fabric with detached sheer. Techniques include working Battlement couching, Burden stitch, chipping and “S”ing. Soft twist silks in solid and overdyes will be combined with braids, crimped purl, check purl, and pearl purl. For dimensional effects we will work the detached elements separately on sheer fabric in the creation of this exquisite embroidery. Students will be encouraged to use their own ideas in color and stitch interpretations. Class Description: With elegant poetry from down glittering corridors hidden in a shimmer of gold from a age long past comes a glimpse of life we can but dream. Giving new interpretation to exotic designs of the seventeenth century and blending them with the silk, metal and beads of the twenty-first, we will create an exquisite three-dimensional floral on canvas with detached sheers. Techniques include working several lattices, chipping and “S”ing. Soft twist silks in solid and overdyes will be combined with braids, check purl, and pearl purl. For dimensional effects we will work the detached elements separately on sheer fabric in the creation of this multi layered exquisite embroidery. Class Description: With elegant poetry and a glimmer from down glittering corridors of an age long past comes a glimpse of life we can but dream. Can you imagine that the inspiration of this piece came from an apron? Giving new interpretation to designs of the sixteenth century and blending them with the silk and metal of the twenty-first, we will create an exquisite floral on silk fabric. For dimensional effects we will be using padding in layered felt or string under shaded couched Japanese gold and various goldwork techniques. Pattern couching, goldwork, and filling stitches are also explored. Five different silks will be combined with Japanese golds, Jaceron, check purl, and crinkle in the creation of this exquisite embroidery. Class Description: Kusudama originate from ancient Japanese culture, where they were used for incense and potpourri; possibly originally being actual bunches of flowers or herbs. They are now typically used as decorations, or as gifts. We will combine the elegance of traditional oriental design with Japanese and Western techniques. For dimensional effects we will be using felt and stitch padding techniques. Japanese embroidery techniques of stamen effect and modified lattices are combined with superimposed embroidery. Class Description: The night is alive with the glow of a thousand lights as fireflies and the perfume of sweet peas. The tiny lanterns skim the edges of thistles as seeds release to float in the warm breeze. Sweet pea tendrils coil and the flowers turn into pods on the soft dark world of the meadow. Black congress cloth and silk and metal threads combine with beads and other unusual materials to preserve the feeling of the warm night. We will be using new composite threads of Gilt Sylke Twist and Color Infusions along with Waterlilies, Soie Cristale. The metal threads include, Grecian twist, pearl purl and braid, Beads sequins and unusual working methods make for a fun and exciting midnight excursion. Class Description: The flash of silver and gold combine with mirrors to create a crystalline drama in needlework. Combining geometric and organic serpentine shapes we will explore the beauty of goldwork. Dimensional use of mirrors adds a fascinating, contemporary look. Mirrors and beads will be attached as we explore new methods of working. Goldwork techniques of cutwork, kid, and couching variations will be employed with needlepoint filling stitches. Knowledge of Hilton stitches, e.g., Amadeus and Jessica, helpful. Class Description: Blossoms of Mountain Laurel burst into bloom in the warmth and freshness of a spring day as memories are echoed in the lacework of leaves. In this silk and metal embroidery, the student will use variegated silk to create a background for the scattered buds and blossoms. Blackwork is used not only for interest upon close inspection but also to create lacy textures from afar. The teacher will create a gold metallic hand stenciled and pounced canvas for each student and demonstrate this technique for the class. The students will also learn: how to lay silk, laid work, satin stitch, radiating Long and Short, couching techniques, knots, and variations of ribbed spider stitch and Blackwork. Size: The 8" X 11" design is on 11.8" X 16," ecru 24 count congress cloth. Materials Needed (Student Supplies): Metal cutting scissors, thimble, straight pins, devise for holding the frame steady and flat, laying tool (tekobari recommended). Lamp and magnifier if needed. The usual needlework tools. Classroom Equipment: Flip chart on easel. Class Description: Combining the elegance of traditional 16th century English design and traditional Japanese motifs with the beauty and glitter of metal thread and surface embroidery we will explore the depth and breath of silk and metal embroidery. Using motifs garnered from numerous sources that I have researched, the students will develop their own designs and stitch patterns to complete a stitch diagram. The students will be come familiar with the traditional metal embroidery of the 16th century and how they can apply that to the present day. The students will design their own unique interpretation from the motifs. Numerous motif and stitch patterns will be provided but the students will be encouraged to investigate their own ideas. There will be a brief discussion of using the computer to develop patterns. Beginning with the arrangement of Thai silk fabrics fused to black Dupionni silk, the student as many design choices. For dimensional effects we will be using padding and raised metal techniques. Goldwork and surface embroidery stitches are explored. All the principles of good design will be stressed. There will be discussion of the types, design implications, and uses of the many silk and metal threads provided. Silk and Metal thread techniques taught include: framing up foundation fabric; fusing fabrics; design transfer; padding techniques, couching: braids purl pearl, passing thread; attaching: check purl with chipping effect, purl pearl, paillettes. Filling pattern: Battlement couching. Surface embroidery stitches: detached buttonhole, woven spider stitch and satin stitch variations with self and felt padding. Class Description: A warm spring morning, bright blue sky, pansies nod in the breeze. Their reflection is everywhere. The sun turns the nights rain to pools of gold. In our embroidery the warmth of the sun reflects in the gold metallics as you shade your pansy created in Japanese gold and soft twist silks. A ring of silk ribbon with beads brings the outer flowers and leaves to three dimensional life. You will learn to couch in pairs to fill a shape with Japanese gold. Making sharp turns with the gold threads will be stressed. We will use the ancient technique of Or Nué to shade the gold into the pansy "floating" in the gold. Ribbonwork with beads form the field of flowers around the perimeter. Class Description: A figure dances to the inner rhythm of life. Come join the party as we explore new ways of working on canvas with fabric applique and silk and metal techniques. Stitches included: On Nué, kid and fabric applique with couched braid, stranded bead couching, chipping, and detached elements. Students will have options for filling patterns. Class Description: Combining the elegance of traditional 16th century design with the beauty and glitter metal thread and surface embroidery we will explore the depth and breath of metal embroidery in the time of Elizabeth I. Using motifs garnered from numerous sources that I have researched, the students will develop their own designs and stitch patterns to complete a stitch diagram. The students will be come familiar with the traditional metal embroidery of the 16th century and how they can apply that to the present day. The students will design their own unique interpretation from the motifs. Numerous motif and stitch patterns will be provided but the students will be encouraged to investigate their own ideas. There will be a brief discussion of using the computer to develop patterns. Students have options of working the sampler in class, pursuing their own design, or work from the teaching sample to become familiar with the design characteristics and materials of Elizabethan England focusing on goldwork. For dimensional effects we will be using padding and raised metal techniques. Detached elements, goldwork, and surface embroidery stitches are also explored. Silk and Metal thread techniques taught include: framing up backing fabric with foundation fabric; design transfer; padding techniques, couching: braids, purl purl, passing thread; attaching: purl purl, paillettes, pearls. Surface embroidery stitches: plaited braid, ceylon stitch, cable plait, detached buttonhole, and woven spider stitch. After choosing a design, the student will be able through a unique system to exchange credits for the silk metal threads they need for their work. Each student will be able to select from a huge variety based of their varying design needs and will develop a plan to start their piece in class or at home. The flash of rubies spark the imagination of present and past cultures. From the court of Ivan the Terrible to Dorothy’s slippers the stone has been the symbol of power, love, and a zest for life—it is a stone of courage, and legend says that a person possessing a ruby can walk through life without fear of evil or misfortune. The stitches explored are Jessica variations in silk and metal. Ribbon and bead applications including work with montees and Czech Loch Rosen crystals are included. Student knowledge of Hilton type stitches will be helpful. Aerial components are wires constructed with montees, seed, and 6 mm beads float above the design area. Today the sapphire gem is known as a Stone of Wisdom, a royal stone of learning and sharpness of thought and vision. It is said that its pure blue light brings order and healing to the mind, lending strength and focus, and an ability to see beneath surface appearances to underlying truth. From the world of couture and goldwork on a foundation of congress cloth, this class will explore a variety of techniques: Chipping, S-ing, couching with and without beads, un point de vermicelli en perle, plus the application of sequins with and without beads and montees. Class Description: A warm summer morning, bright blue sky, a field of daisies? Those aren't just daisies, look underneath. Strawberries! Where's my basket? Nevermind, I 'll just sit here a while, no one will know as long as I wash the red from my fingers. My secret and a secret place. There once was such a place. Whether it is still there I don't know; but this shaded silk and metal piece can take you there in spirit. The warmth of the sun shines in the gold metallics as you shade your strawberries created in Japanese golds and Zwicky silks over padding. You will learn to couch in pairs, to and fro, round and round to fill a shape, and outwardly coiling with 4 sizes of Japanese gold. Making sharp turns with the gold threads will be stressed and you will learn to pad a shape with felt and cord. Materials Needed (Student Supplies): Another set of Koma would be helpful; see kit cost. Metal cutting scissors, thimble, straight pins, devise for holding the frame steady and flat, laying tool (tekobari recommended). Lamp and magnifier if needed. The usual needlework tools including a cover for transporting the work. Class Description: A fresh breeze brings the fragrance of wisteria as butterflies dance. Using realistic and stylized techniques in silk and metal canvaswork we will interpret the warmth and joy of a summer day. Students will develop the design of their composition in motif and color placement. Butterflies in satin, long and short and shaded, couched black Japanese gold are dancing among leaves that are developed from the choice of the needlepoint stitches. The use of variegated color placement will be discussed. The flowers are formed with various padding techniques under satin stitch with goldwork anthers. Leaves are needle point filling stitches with stems and tendrils in couched twists. Good technique in laying stitches and the use of variegated silk will be emphasized. Accents of goldwork add a feeling of opulence to the summer sunshine. Class Description: Combining the elegance of traditional 16th century design with the beauty and glitter metal thread and surface embroidery we will explore the stitch techniques in the time of Elizabeth I. Using motifs garnered from numerous sources that I have researched, the students will stitch a design appropriate to both the 16th century and the 21st. Stitches explored: Plaited braid; heavy chain; woven spider; Ceylon; open Ceylon stitch, threaded and overcast; spiral trellis; detach buttonhole, with and without a detached element. The stitches will be worked in combinations of silk, silk and metal and with a new composite thread: Gilt Sylke Twist. Class Description: Transporting the embroider from the inspiration of illuminated manuscripts to a misty Summer morning, this design is reminiscent of the hand painting and gold leaf used to illuminate the pages of the handwritten books of the Middle Ages combined with the essence of a Solstice dawn. The silk and metal threads used in combination with heavy padding techniques add tactile as well as visual appeal. A medallion of silk and metal is joined to borders of padded flat silk with superimposed scrolls of couched gold leaves. Enclosed by the borders is a vista created with the use of random Long and Short stitches in variegated silks, some over padded areas. The tree is a combination of needlepoint stitches and couching silk over padding. Metallic counted thread patterns form the background. Techniques included: Padding over string, felt, and padding cotton; couching metallics and various silk threads; laying Flat silk; and surface embroidery, counted thread, and needlepoint stitches. The student will learn to manipulate the colors in the variegated silks to accomplish their own individual feeling toward the design. The 7 1/4 X 8 inch design is worked on ecru Congress Cloth. Kit Includes: All fibers and foundations necessary to complete the design. Class Description: Transporting the embroider from the inspiration of illuminated manuscripts to the crystalline essence of snow, this design is reminiscent of the hand painting and gold leaf used to illuminate the pages of the handwritten books of the Middle Ages combined with the essence of a Solstice night. The pine trees, under their burden of snow, cast shadows on the frozen pond as moonlight illuminates the scene. The silk and metal threads used in combination with heavy padding techniques add tactile as well as visual appeal. A medallion of silk and metal is joined to borders of padded flat silk with superimposed scrolls of couched silver twist and #1 silver to form trailing pine branches. Enclosed by the borders is a vista created with the use of random Long and Short stitches in a variety of silks and combined with silver, some over padded areas. Metallic counted thread patterns form the background. Techniques included: Padding with string, and felt; couching metallics and various silk threads; Kid appliqué; applying beads; laying Flat silk; and surface embroidery, counted thread, and needlepoint stitches. There will a color selection available. The 7 1/4 X 8 inch design is worked on ecru Congress Cloth. Materials Needed (Student Supplies): Metal cutting scissors, fabric scissors, thimble, straight pins, devise for holding the frame steady and flat, laying tool (tekobari recommended). One set of koma is necessary it may obtained from the teacher at extra cost. The usual needlework tools. Lamp and magnifier if needed for working #24 Congress Cloth. Classroom Equipment: Floor easel with flip chart.